My Bible Adventure Through God's Word was written by pastors, children's ministers and leaders who have a heart for helping children become lifelong believers in Christ. 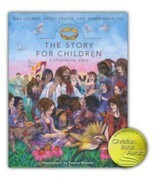 Featuring 52 simply retold Bible stories that will strengthen your child's knowledge and faith in God's Word. 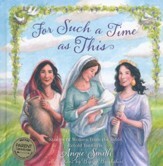 Each story includes a Scripture passage, a devotion, a prayer, and a truth about God for your child to hold on to. Featuring colorful illustrations and a simple text that is easy for young children to comprehend. Travel through Gods Word all year long! 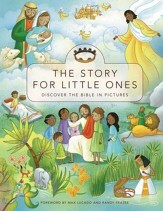 The greatest stories in the Bible come alive for kids in My Bible Adventure Through Gods Word. 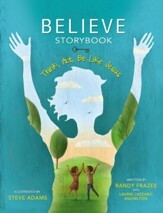 Watch your children develop a relationship with God while reading amazing stories of faith. 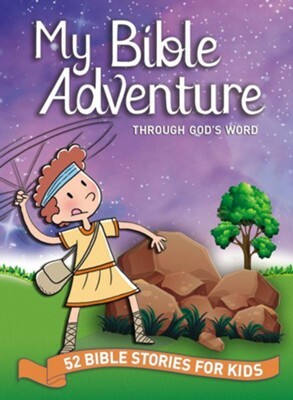 Written by pastors, childrens ministers, and leaders who have a heart for helping children become lifelong believers, My Bible Adventure Through Gods Word is a perfect tool for introducing your children to weekly devotions. Cute art and simple storytelling naturally lend themselves to early readers who are starting to read on their own. With tangible takeaways and prayers at the end of every Bible adventure, your children or grandchildren will grow in their faith as they read My Bible Adventure Through Gods Word. Help your child engage his or her faith in new, meaningful ways through the wisdom and insight in My Bible Adventure Through Gods Word. By starting the habit of studying the Bible at a young age, your young believer is signing up for the adventure of a lifetime! Johnny Hunt is the general editor of Grace, Hope, and Love, part of the MyDaily® Devotional series that has sold more than 700,000 copies. Hunt is the former president of the Southern Baptist Convention. Pastor Johnnys educational credits include a BA in religion from Gardner-Webb College. He continued on to Southeastern Baptist Theological Seminary where he earned a Master of Divinity in 1981. Southeastern honored Pastor Johnny in 1997 by naming The Chair of Biblical Preaching in his honor in 1997. He has also received several honorary doctorates over the years for his work in ministry. Hunt and his wife, Janet, enjoy their two daughters, Deanna Carswell and Hollie Hixson, and 4 grandchildren. I'm the author/artist and I want to review My Bible Adventure Through God's Word: 52 Bible Stories for Kids.